You are here: Home / What is Basal Cell Carcinoma (BCC)? Basal cell carcinoma (BCC) is a form of skin cancer that develops in the top layer of the skin. It is by far the most common type of skin cancer—of the 3.5 million cases of skin cancer diagnosed every year in the United States, nearly 80% are basal cell carcinomas. BCCs are cancerous lesions or tumors that are made up of damaged or mutated basal cells. These tumors form in the outer layer of the skin, and appear as small bumps or sores. BCCs rarely spread beyond the original location of the cancer. Like all forms of cancer, basal cell carcinomas are the result of damage to the DNA of the cell. When a cell is damaged in certain ways, its DNA mutates, which can cause the cell to reproduce in an abnormal, uncontrolled way. Unregulated cell growth causes the formation of cancerous lesions or tumors. While BCCs may form anywhere on the body, the most often appear on areas that are regularly exposed to the sun, such as the arms, neck, and face. Human skin is made up of two main layers: the epidermis, which forms the top layer of skin, and the dermis, which forms the bottom layer. The epidermis functions as the protective outer shell, while the dermis contains blood vessels, hair follicles, melanocytes, and other specialized biological structures. Within the two layers of skin, several different types of cells can be found. Each type of cell serves a different role in the normal functioning of the skin. 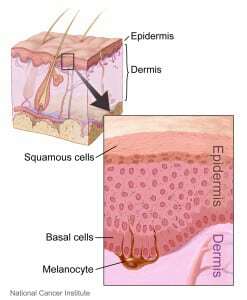 Basal cells can be found in the deepest layer of the epidermis. While their specific purpose isn’t completely clear, scientist believe basal cells serve as a type of stem cell—basal cells start out as relatively undifferentiated, but rapidly reproduce and aid in the process of creating new skin cells. BCC is highly curable when discovered and treated in its early stages and almost never spreads to other areas of the body or becomes life-threatening. However, BCCs can be disfiguring and lead to dangerous complications if not treated promptly. An open sore that frequently fails to heal and bleeds, oozes, or crusts for multiple weeks at a time. 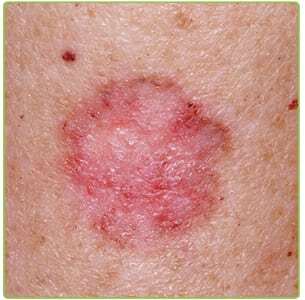 An irritated patch that may be red in color and itchy or sensitive to touch. A slick red, white, or pink bump with a pearly finish. A pink growth that contains a crusty center surrounded by an elevated pink ring; enlargement of the ring sometimes results in appearance of tiny blood vessels on the skin’s surface. A scar-like area that may be white, yellow, or waxy with irregular and poorly-defined borders; this specific warning sign may indicate that the cancer is larger than one might expect. Risks factors refer to characteristics or traits that may make a person more likely to develop cancer. Many risk factors are associated with basal cell carcinoma, ranging from hair color and skin tone to family history. If you are diagnosed with BCC, you have many excellent treatment options to choose from. Each option has shown high rates of success. By performing frequent self-exams, as well as going regularly to visit the dermatologist, you can protect yourself from the dangers of BCC. Skin exam. During a skin exam, a dermatologist or nurse looks over your skin to identify any unusual marks, lumps, rough patches, freckles, birthmarks, or any pigmented area with an unusual color, size, shape, or texture. Biopsy. If an area of your skin is identified as abnormal, and your dermatologist wants to do further analysis, a biopsy may be performed. A biopsy is a minor medical procedure in which an abnormal area of skin is removed with a scalpel and examined under a microscope by a pathologist. Surgical excision. Excision refers to a surgical procedure that involves numbing the area to be treated with local anesthetic and cutting away the tumor along with a thin margin of normal skin. For BCC, surgical excision is typically a minor, outpatient procedure performed at your dermatologists office. Mohs surgery. Mohs surgery is a common surgical technique for early stage melanoma. During treatment, your doctor (usually a dermatologist), surgically removes one very thin layer of skin at a time at the site of the cancer, checking each layer under a microscope as they go to detect the presence of cancer cells. When they reach a layer with no cancer cells, the surgery is over. Curettage and Electrodessication. Generally performed on smaller lesions, this procedure involves scraping off the tumor with an instrument called a curette, which has with a sharp, ring-shaped tip. After scraping, electricity is used to destroy and remaining cancer cells. Cryosurgery-liquid nitrogen. Liquid nitrogen is applied to the tissue to freeze and destroy the tumor and a small margin of surrounding tissue. Photodynamic therapy (PDT). PDT uses a topical gel and special light to destroy early-stage BCC tumors. A gel is applied to the area of the tumor and given time to sink in. Then, a special light is shined on the area, causing a bio-chemical reaction which kills the cancer cells. Medicated creams. For small, early-stage BCCs, medicated creams may be used to destroy cancer cells. Patients typically pick up the medication at the pharmacy and apply the cream themselves. External beam radiation has been used for decades to treat nonmelanoma skin cancer, including BCC. While less than 1% of cases are treated with radiation currently, a recent body of evidence has verified the effectiveness of the technique with high success rates and low complication rates. Superficial radiation strategies are especially convenient for patients on blood thinners, those with complicated lesions around the face, or those with multiple lesions where extensive surgery would be disfiguring or debilitating. Many times a multi discipline approach using the skills of the dermatologist, Mohs surgeon, and radiation oncologist can bring about the best customized option for individual patients. Skip the surgery. Learn more about radiation therapy for nonmelanoma skin cancer. Where is Skin Cancer Most Common? 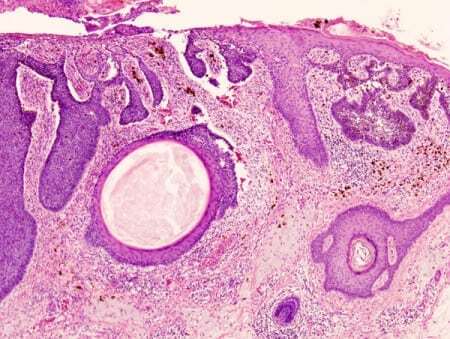 What is Dysplastic Nevi (Atypical Moles)?